Technology goes hand-in-hand with collaboration, often providing a ‘single source of truth’, and essentially enabling collaborations to scale beyond a handful of team-mates. Our guiding principle is to let the people and the process determine the tool, and not the other way around. We keep up with the latest digital trends to help you find the right tool for the job. Over the past 7 years, however, we’ve noticed some patterns repeating over and over again. That’s why we’ve developed the Collabco Collaboration Platform, and Collabco Innovation Management System, open source platforms uniquely suited to collaborating to get big things done. Collabco Innovation Management System (IMS) is the latest technology offering from Collabforge. Developed with innovation leaders in the Australian Federal Government, our software comes ready to support a follow innovation journey, from challenges filled with ideas, through to nurturing ideas into projects. At each step (as you might imagine) team-forming and collaboration is encouraged. Keen to learn more? Visit the collabco website here or jump to the demo site to try it out. When you are creating something new, or solving a really big challenge, there’s no way around collaboration. We instinctively know that digital technology can help us collaborate with more people, more easily, but how do you get started and what tools should you use? 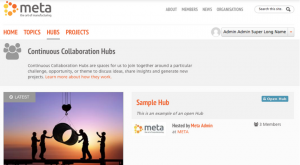 Collabco answers this question with an online platform designed by and for public sector collaboration and innovation. Collabco helps you add the power of digital mass collaboration to your existing organisational challenges. Whether you are trying to consult on a strategic plan, or cultivate a new community of practice, Collabco provides an integrated suite of tools that can scale up the way you work together. Smart organisations know that collaborative approaches, powered by digital tools, tap into the enthusiasm and power of the community to get big things done. 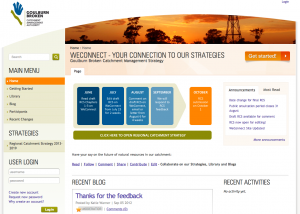 Collaborative wikis: Write strategy, plans, documents and more with your whole team or select stakeholders. Open discussions: Inspire conversation on important topics, make informed decisions. Groups: Move your conversations into focused discussions with key stakeholders or whole teams in public or private digital spaces. 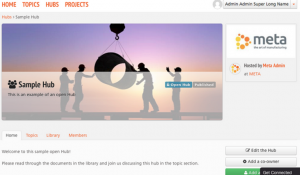 Library: Knowledge management features to centralise documents submitted in discussions, groups or projects. User dashboards: One spot to help users know exactly what to do when they first visit the site, and easily find and re-engage material. User profiles: Connect with fellow collaborators, learn about their areas of expertise, and draw them into collaboration. Activity focused: Draw user focus to new and promoted content through customisable email, in-site notifications, and activity stream. Scalable: Collaborate with 5 or 500, using just the tools your users need. Fully customisable: Use your branding and design to provide a seamless experience. Works on any device: Access all features on your computer, tablet or smartphone. Designed for non-experts: Built with the needs of the less tech-savvy user in mind. Always improving: New features are added based on the feedback and wishlists of active collaboration practitioners, innovative firms and you. Fully supported, managed solutions: Simply use the software. No need to manage, develop, upgrade or hire for it. Collaboration on every level: From the practitioners using the software to the developers creating it, the software is open-source and collaborative. 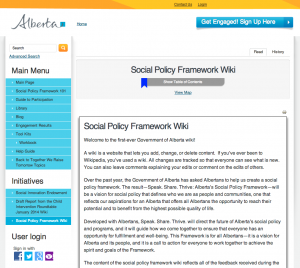 Together We Raise Tomorrow provided a single online destination for all aspects of Alberta, Canada’s Social Policy Framework consultation process, including wiki-driven collaboration on the policy itself. Following this initial collaborative consultation which generated the state government’s first social policy framework, Collabco has been subsequently used to develop the framework’s sub-strategies. Based on this work, the Alberta State Government has established a $1B social innovation endowment. The 2013- 2019 Regional Catchment Strategy represented an important opportunity to reinvigorate community engagement in catchment management, as part of a broader strategy to improve community-based problem-solving and resilience. Thus, it was critical that the engagement process would embody this new level of transparency and shared ownership. The platform not only provided a one-stop-shop for participants to find information and stay up-to-date, but it also made the process of strategy development fully transparent and collaborative through the use of a structured wiki. Participants could directly edit and influence the content of the strategy, but could also increase horizontal awareness of their fellow inhabitants within the catchment who were also contributing to the platform. 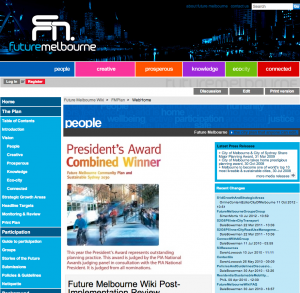 Future Melbourne was a world’s first as a wiki-based collaborative city plan. Future Melbourne was the city’s 10 year vision for the city setting the goals and directions for all aspects of life in the city. The online platform was used by Council Officers to draft the policy. Then during a four week consultation period, anyone from anywhere is the world could register to edit the actual content of the plan – essentially in real time 24 hours a day, 7 days a week. Users could post any text or media they wished. What resulted was essentially real time collaboration between city planners and officers and the public. 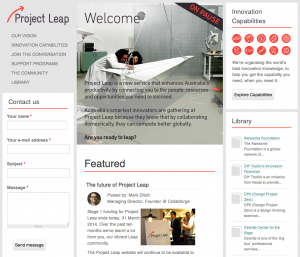 Project Leap was part of the Federal Government of Australia’s Industry Innovation Network. The initiative successfully used Collabco with a small database of extremely influential, high value individuals within Australia’s innovation ecosystem. The initiative’s face-to-face activities such as the Leap Workshops (accelerated innovation workshop for teams, based off the Collabco online activities) and the Zip Breakfasts were all highly praised. These offline activities were also a great catalyst for encouraging users to start interacting with the network and continue their conversations online. Project Leap, the ‘front porch’ for the Industry Innovation Network, used Collabco to focus on curating useful and inspiring content for Australia’s innovators. META had a mandate to engage industry and academia to come together on innovation projects which would benefit the industry. A core component of this initiative was the need to progress members from early conversations about interests & needs, to coordinating and organising projects. Collabco was modified to promote private group spaces, allowing members to collaborate without the ‘noise’ of the larger audience.